I’ve posted reviews on Van’s gluten-free products previously, as our son absolutely loves their gluten-free waffles, snack bars and cereals. So when they sent us some new product offerings we were happy to give them a shot. They’ve branched into granola and pre-packaged pastas, which was definitely a bit surprising at first, since most of their other products are snacks and/or sweet breakfast foods. We know they have the sweet area down, but were curious how they handled savory. 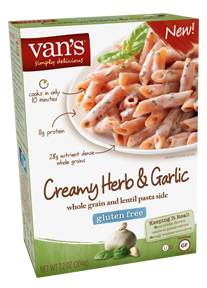 Since we’re dairy-free we can only review one of the pastas, but will update this post with friend’s opinions once they share their thoughts on both the mac-n-cheese and creamy herb and garlic. If you want to find them in your local store, check out their store locator on their site. If you’re in Austin, you can find them at most HEBs. 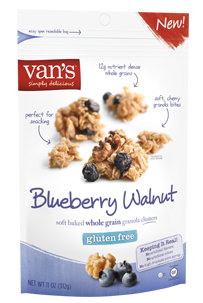 Van’s gluten-free granola comes in two yummy varieties, Cranberry Almond and Blueberry Walnut. Both are perfectly balanced sweet and soft bites with 12 grams of nutrient-dense, gluten-free whole grains. We enjoyed them in yogurt, as a cereal with some vanilla almond milk and as a simple grab n go snack option. Our son loved both favors and we ended up mixing both into a snack container for him to take to school. Definitely loving this new granola option, and we found it at our local HEB. 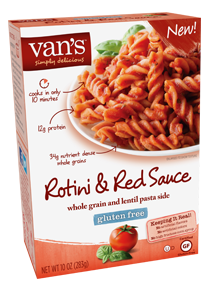 Another new offering from Van’s is their packaged pasta options, which they market as a simple, convenient way to bring some tasty gluten-free pasta to your dinner routine. We tend to make our own pasta here, and prefer fresh home-made pasta sauces, but if you’re in a pinch these are pretty good options to have on hand. We love that, as usual with Van’s products, they kept the ingredients list clean and simple, making us feel good about making these for our son. Since we’re dairy-free we could only try the Rotini, but I can tell you it was much better than expected from a packaged meal, and they’ve done a great job of keeping the ingredients clean without compromising on flavor. If you’re looking for something easy to keep on hand for those short-on-time nights, this is a great option! Gluten Free Penne Pasta (Brown Rice Flour, Red Lentil Flour, Beet Powder, Tomato Powder), Marinara Sauce (Tomatoes [Tomatoes, Tomato Puree, Citric Acid], Water, Tomato Paste, Olive Oil, Onions, Sugar, Basil, Garlic, Salt, Citric Acid, Black Pepper). Gluten Free Penne Pasta (Brown Rice Flour, Red Lentil Flour, Beet Powder, Tomato Powder), Garlic & Herb Seasoning (Reduced Lactose Whey, Rice Flour, Milk Powder, Parmesan and Romano Cheese [Milk, Salt, Cheese Cultures, Enzymes], Natural Flavors, Salt, Sugar, Spice, Garlic Powder). 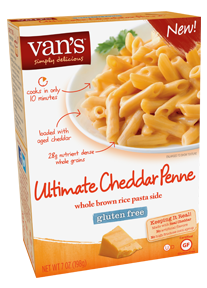 Gluten Free Penne Pasta (Brown Rice Flour, White Rice Flour), Aged Cheddar Cheese Seasoning (Cheddar Cheese [Milk, Salt, Cheese Cultures, Enzymes], Nonfat Milk, Salt, Whey, Sugar, Buttermilk, Rice Flour, Natural Flavors, Annatto Extract [For Color]). 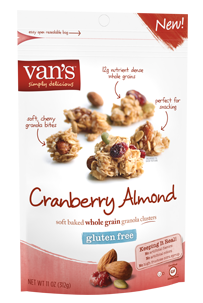 Disclaimer: Van’s sent us their new products to try with a request for a review on the blog. As always, I only share our honest opinions/reviews.